Self adhesive backed neoprene rubber is available in rolls up to 1m wide and thicknesses of 3-20mm. 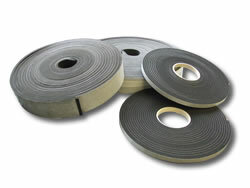 SAB rubber strips can be cut to length as required and are ideal for draught exclusion and use on flange gaskets and manhole covers. For further information please contact Trevor on 01733 894949.